Tracing the development of German socialism in Britain and on the continent in the mid-nineteenth century, this is the first substantial study to combine two very important aspects: an analysis of this crucial stage in socialist political theory development and the examination of the social and cultural environment of this immigrant community. 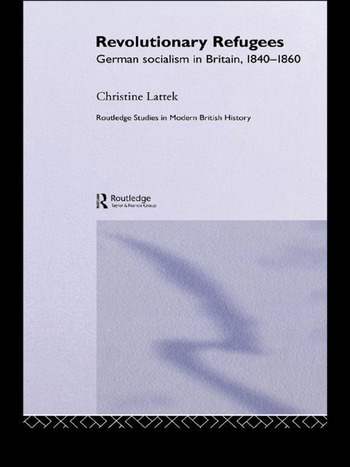 Combining these two key aspects, Christine Lattek places the development of exile politics in the overall framework of the flourishing German colony and in doing so fills an important gap in our understanding of the development of early German socialism. The result is an engaging and essential read for all students and researchers of modern history. Christine Lattek was educated at the universities of Berlin, Tübingen and Cambridge, where she recieved her PhD, in 1990 for her thesis on German Socialism in British Exile. She specialises in modern and contemporary German history, and has written on the nineteenth century German radical reform and feminist movements as well as on the Holocaust. She currently lives in London with three small children and works as a translator and editor.